Planning to build or remodel your own studio can quickly be an overwhelming and daunting task. There are so many details and choices that factor in to creating your ideal studio, beginning with your own goals and expectations and carrying through its overall function and your style of recording. Factors like what clients will expect, the type of music and audio you usually work on, the ergonomics of the building and your personal workflow all dramatically influence how your studio may be built. At Pure Wave Audio, we consider every detail while consulting to give you the most streamlined and complete install that will meet your needs and exceed your expectations. Pure Wave Audio's owner Jim Pavett has been helping educate people about audio production and recording for nearly a decade and will bring his expertise to you. Our team will look at your short and long-term goals, realistic budget and the specific demands of your location including space, layout, isolation, HVAC, and power. We will also discuss your personal workflow, philosophies of gear selection, and many more details to help you succeed in your audio endeavors. Creating a cozy writer's room, an efficient project studio or a fully commercial production facility are all real possibilities but they each have different needs. We can help you align your goals and needs for success. Pure Wave Audio helps Music Serving the Word, spread the Word! 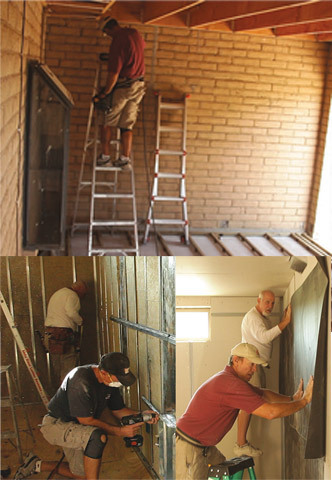 Pure Wave Audio was hired to renovate a multiple room studio for Music Serving the Word Ministries in Carefree AZ. MSW is a cutting-edge organization that uses music, media, outreach, teaching and technology to accomplish its mission. MSW’s engineer Rob Moore was impressed with the information and philosophy that we shared on our website, so he contacted Pure Wave Audio for a consultation regarding a full studio renovation. This four room renovation required precise execution. Some of the influencing factors we had to consider included: multiple rooms, a condensed timeline, active production schedule and delivery to a remote location. The Pure Wave Audio crew installed 100 custom acoustic panels, a completely overhauled control room, professional level signal path including microphones, preamps and convertors, premium Vovox cabling throughout the facility, as well as an Aviom monitoring system. Over the course of two months of planning, and 3 days of installation, the visual aesthetics and sonic difference brought new life through an amazing transformation for MSW. We took the opportunity to capture a time lapse video of the install for you to see. If you are interested in a studio renovation or have questions, please contact Pure Wave Audio by email or phone. Pure Wave Audio was hired to design and outfit a studio which would share a wall with an existing home. Basically a new addition to the home including one room with new HVAC and power. This room had to be very isolated so the family in the home was able to conduct their lives with no intrusion. And also the neighbors, who were very close, were not disturbed either. The end result exceeded expectations and the install just so happen to align with the filming of the Studio Edge’s tutorial on how to build a studio. So we filmed the whole thing. Check out this teaser and feel free to check out the Studio Edge Series.